After a difficult 300K in February, it was time to redeem myself. My spring break fell in between NAHBS and the San Francisco Randonneurs Russian River 300K. I was going to head north to stay with my in-laws, write a little, and ride a little. But I couldn’t be away for two weekends, so the choice became clear. It was easy – ride with SFR and skip the show! The adventure begins on I-5. 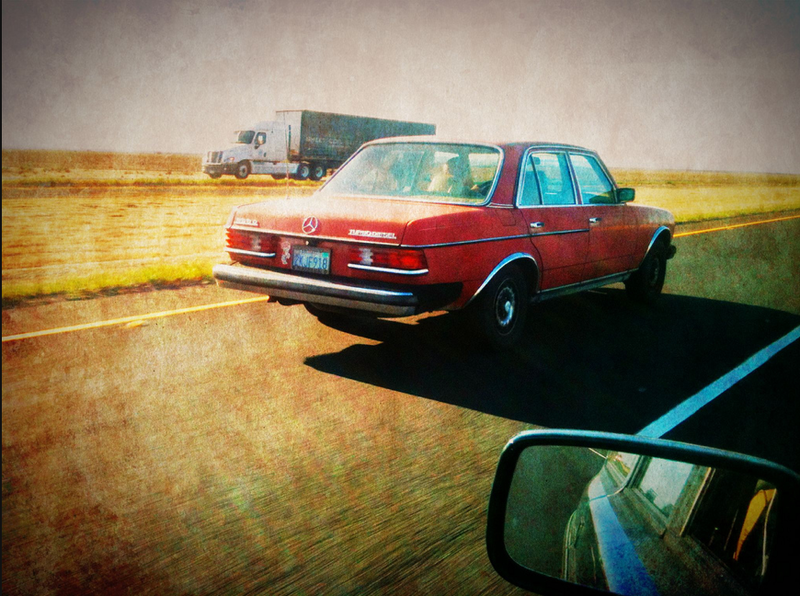 Cool W123. 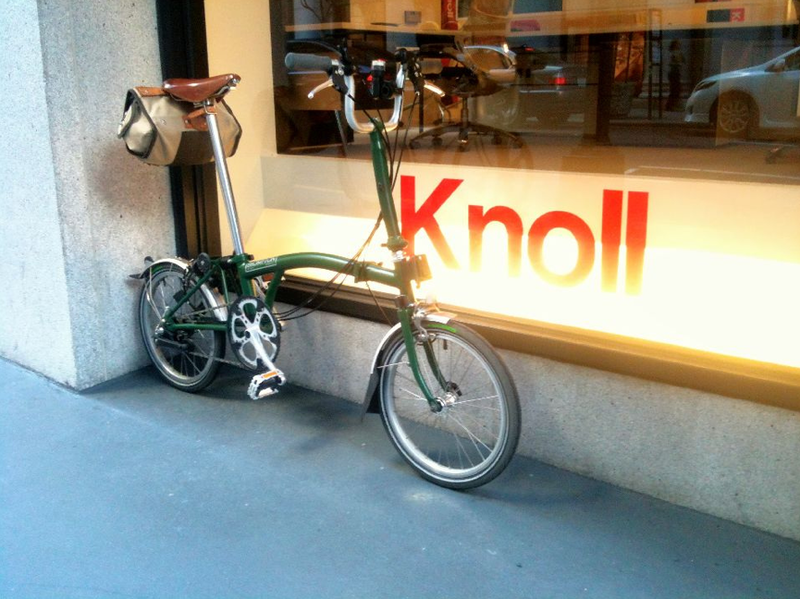 I took the Brompton, the Protovelo, and the Ebisu up for the trip. Its rare I get to drive up with an empty Volvo station wagon, but being alone, I had plenty of room for a different bikes for different riding. The nearly theft-proof Brompton took me around the city and Oakland while cafe-hopping, rode the Protovelo around the East Bay, and took the Ebisu into Hiroshi to inspect the wheels and size some low-riders. I couldn’t believe it, but the chain needed replaced after only a year of riding. Hiroshi remaked gently that randonneuring is tough on bikes, and that components may need more attention than nomral. It was nice to visit with Hiroshi, and I got to go to Rivendell and talk with those guys, and check in with the fellas at Box Dog. The weather looked great – overcast and cool. There were more than 100 riders at the start. We took the pledge, said some hellos, and headed off over familiar territory. With SFR, I’ve ridden Lighthouse and Two Rock/Valley Ford 200ks, Old Caz 300K, and Healdsburg/Hopland 400K. All of them I absolutely loved. The terrain is varied, and the course – especially from the bridge through the Marin towns – feels as familiar as home. We made our way through the Marin towns, and then up toward Petaluma. 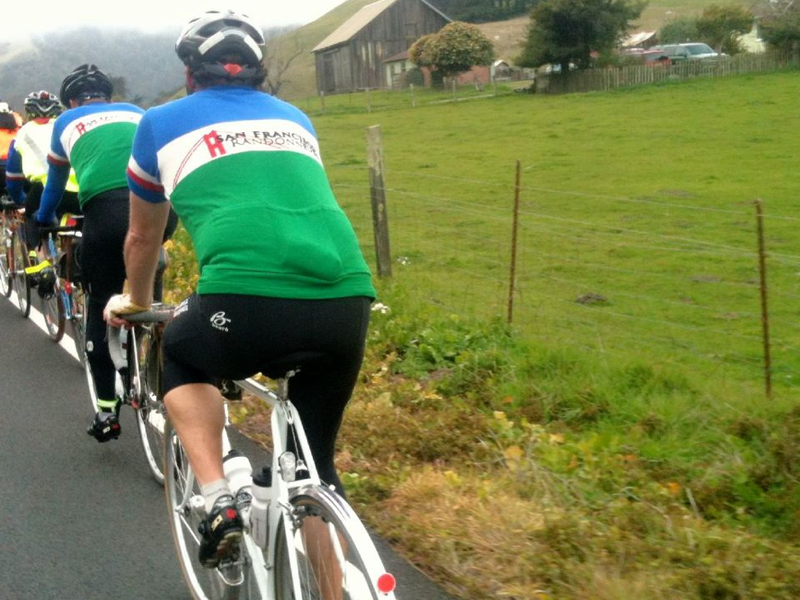 I fell into a group following Willie’s tandem into Healdsburg, perhaps the easiest 30 miles I’ve ever ridden. At the Safeway in Healdsburg, the thought occurred to me that I’d break off on my own through the grape vines of Healdsburg and along the Russian River on River road, but luckily I found Bruce on his excellent white Ebisu and we traded pulls for a while. Then we found a larger group including Carlos and Bill and pacelined toward Highway 1. The wind howled, and the heavy fog turned into light rain down Tomales Bay. 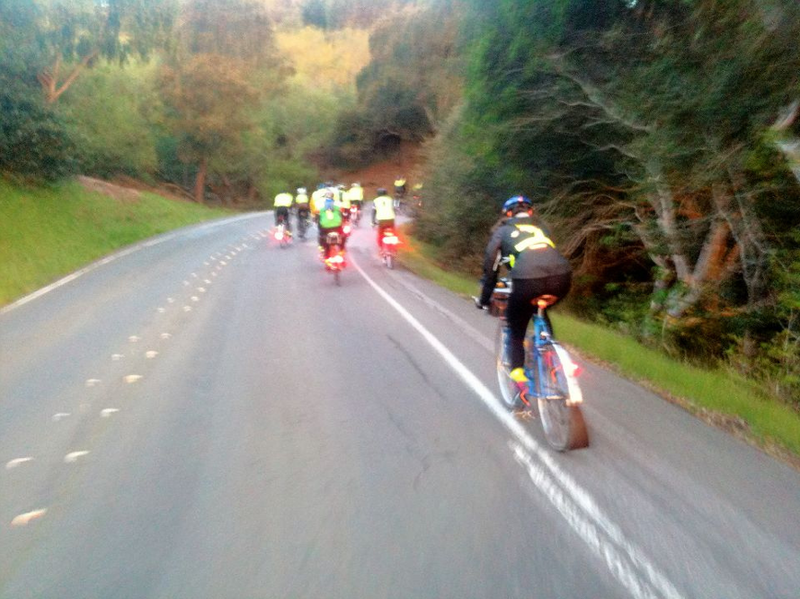 The rollers between Bodega Bay and Marshall include climbs that slap you in the face, but the rollers after Marshall are more even. Something on the Edelux light mount was wrong, began to slip, and the mount broke in half before i got the Golden Gate Bridge. Besides fidgeting with the light, it was an exceptionally enjoyable day. I finished in 14:50. Paceline is cool. Photo by Hillbubba. Happy rider. Photo by Hillbuba. By and large, this was my favorite course yet. Glad you could join us for the ride. I was happy that the warning about thousands of drivers up in the vineyards was way over-hyped. My impression was that it was exactly the same traffic we’ve always seen on that ride: a little crowded after we leave Healdsburg but after 5 miles we have the road to ourselves again. Yea, I thought traffic seemed especially light. This is on my schedule for next year! What a great day. Thanks for all your work. I gotta go do a San Diego brevet and buy me one of those swank SDR wool jerseys. Next time there’s an order (not for a while, I’d imagine), I’ll alert my northern brethren. Wish i could have joined you guys but I’m so far out of shape this year. Still I love reading about it, could job my friend. Thanks – wish you were there – but a break is good! Nice to see you my friend. Glad we had some saddle time together. The DNF – Lemonade out of Lemons.